I feel quite guilty regarding the lack of posts in the last week and must apologize again to my readers. The fact is that I have run out of steam and circumstances have dictated that I take a bit of a breather. It has proved difficult to raise any enthusiasm on anything happening in the sport at the moment and each day's news, especially on the Max saga, brings only a response of "so what?" from me. I am facing facts, therefore, and extending my rest until the weekend (only a couple of days away); regular posting will resume thereafter, I promise. Other bloggers have been doing an excellent job of dissecting the news anyway and I have little to add. Keith Collantine continues to show how it should be done on his most excellent F1 Fanatic blog and Joe Saward has written two very good articles on Sebastien Bourdais' departure from Toro Rosso and Jean Todt's candidacy for Mosley's job. That last fills me with horror and dread and it will be a while before I can enumerate all the reasons why he is the last man who should be FIA President. I can only hope that the FIA experiences a rare moment of good sense and elects Ari Vatanen to the post. Otherwise, I have only a couple of points to make, both in the nature of setting things straight. There is the matter of Lewis Hamilton's puncture at the Nurburgring, for instance, and the question of whether Lewis was foolhardy to attempt the first corner in the way that he did. Keith Collantine has already pointed out (but it seems to have been ignored by most commenters) that Hamilton's rear tire was already flat as the cars approached the corner. This is quite clear from the photograph used to illustrate Keith's article, Webber shrugs off penalty to grab maiden win (German Grand Prix review) - note how the right rear appears lower than the left. Whether Hamilton was aware by then that he had a problem is debatable but there can be little doubt that he was committed to the corner on a line assuming that the tires were fine. In the circumstances, it is remarkable that he made the corner at all. And then there is poor Nakajima, still being condemned as a likely candidate for sacking in Bourdais style this year. Yet Kazuki qualified higher than Rosberg in Germany and set the fifth fastest race lap, quicker again than his team mate's. His race was ruined by a collision with Trulli on the first lap for which both drivers blame the other; my recorded race video misses the relevant incident and so it is impossible to know whose fault it was. Naturally, Nakajima's critics assume that he messed up again (as if Kazuki were prone to incidents - which he is not) but Trulli's account indicates that the Japanese driver was ahead of him at the time. If that is the case, the responsibility was on Jarno to avoid a collision. So Nakajima is actually doing rather well and his improvement continues to the point where he is a worthy team mate to Rosberg. He may have the seat thanks to the influence of Toyota but he happens to be a very capable F1 driver too. If luck ever smiles on him for a change, he is quite capable of making life difficult for Nico. You never know Clive you might awake tomorrow to find the Todt candidacy was a horrible nightmare......... Oh look a flying pig. In the mean time it`s pipe, slippers and Irish coffee Im afraid. Gusto: That sounds like an excellent prescription indeed. I shall try it! I always like reading your stuff Clive so I hope you keep it up - understand your frustration with the political side of things, though. Sad to say it's not likely to get better if Mosley's favoured son gets his way. Keith: Oh, I'm sure this is just a temporary hiatus, Keith - I've been blogging for years so am very familiar with the occasional period of blogger's exhaustion. It does seem to have been Max's constant shenanigans that brought it on this time, however, and I really cannot face the possibility of his favored candidate continuing in the same vein in the coming years. It gives us something to write about, yes, but dang, it's incredibly wearisome after a while! I´m one of those F1 Insights´s addicted, getting back here any hour to see if you have posted anything. I hope you get back soon mate, we need you. About Lewis, the guys from FOM has been released a video on Formula1.com that shows — with an on board camera on Mark´s car — the moment in that Mark clipped Lewis´s tyre. That was a shame for him. Becken: Thank you for your kind comments, Becken - they are much appreciated. Unfortunately, I am not able to update Gone Away often these days as other things claim my energy and attention. But I post when I can and always intend to get back to regular posting on it. Clive: I check your blog every moment I get, as well. I enjoy your take on things and I really enjoy the thoughtful and respectful commentary of your fans... That being said, take all the time you need. I'm not going anywhere. The Hamilton incident at turn 1 was great! Win or lose, he is always trying; I couldn't help but jump out of my seat and cheer, followed by extreme disappointment if only for the fact that I wanted to see a fresh face in the battle. The brief possibility that Hamilton could make a play of it, dimmed the enthusiasm I had for Webber's first win (even though it shouldn't have). Regarding Toro Roso, I feel for Bourdais, but I think the situation is more of a reflection on the management of that team than on the job Bourdais has done. As regards Toro Rosso, I think their management of drivers is terrible but I tend to agree with those who think that Bourdais has had his chances and missed them. 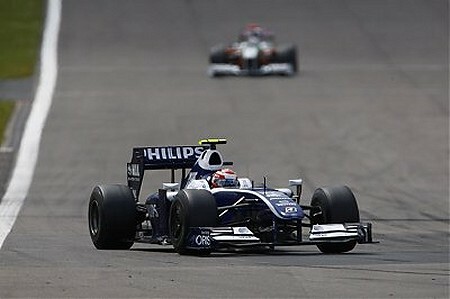 He has shown little spark of outstanding ability and that is what is required in F1 these days. Wanting to park the car because it is damaged is not only far from 'giving it a go', it is shameful behavior for a driver..
aracerdude: Hamilton's desire to save the car is a reflection of the present rules. When G. Villeneuve tore around the track trailing a wheel, he new perfectly well he would have a new car, engine and transmission included, next time he needed one, without penalty. To try hard with inferior equipment today can turn into a punishable act that, at some point can have you put back 10 places. Don't blame the drivers, blame the BS rulebook. Clive: I sympathize totally with your racing apathy. The present situation leaves one feeling like the victim of tainted food. It leaves one with precious little appetite. It's sad about SeaBass...but as you said, he had a fair shot and couldn't make it happen with that team. Let's hope one of the new teams will pick him up. The Todt candidacy is very worrisome to me. It would appear we'd have the same sort of "my way or the highway" type attitude from him as we had with Max...and we all know how well that turned out. Take some time, Clive. Refresh yourself. We're only half way through the season...there's so much more to come. I just want to say thank you for your excellent work on this blog. No doubt it can be quite a strain constantly updating it. I for one have no problems waiting for your batteries to be recharged. You run a great site and I always look foward to reading your comments. Thanks for giving me something to look foward to when I'm on the internet. Some people seem to think Todt would be no more than Mosley's pawn but I really can't see the Toad being that submissive. As you say, the danger is that he would be as arbitrary, dictatorial and sef-serving as the present President. And that is not a pleasant prospect. Steve: Thank you indeed for the kind comments. I feel better already and am seriously contemplating a post today! I thought it was during the Todt era that Ferrari struck the deal with the FIA. It is possible he didn't have anything to do with the actual negotiation, yet having him as FIA president would call into question the impartiality of his administration not just because he was Ferrari team principle but also because he was a man willing to compromise his team's integrity for an advantage. I will be upset if Todt is successful, and the FIA will be confirmed as corrupt. Clive, have you tried FIA Darts, You take 40 pictures each of Max and Bernie, you then place them in the relevent boxes( Max in the various rhombus shape sections, Bernie in the double and treble sections, to keep it to scale), you then take the FIA flavour of the week and they go on the bullseye, the winner is the one who gets to 1001 ending on a double Bernie.................................( Shhh but I think Clive`s taken a Apollo 40th break ). Thank you for the clarification Nick, I wasn't aware modern day drivers made team strategy. I just assumed they were paid to drive. Pushin my luck now, How about a blog about the GP the day before they landed on the Moon. aracerdude: Yep! Paid to move over when they're told, paid to say what they're told to say, paid to follow instructions and paid to go away if they show too much personality or initiative.